I had hoped to review the last books of 2009 before the year had finished but unfortunately I literally ran out of time. So before the New Year leaves it fledgling status, here are three mini reviews of the last three books I read in 2009. I did start reading two new books last week, but I only managed to read about five pages from each, so they will go towards this year's total. 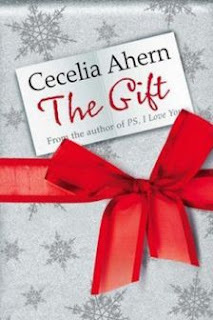 This is the first book I have ever read by Cecilia Aherne and I was quite surprised by how much I actually enjoyed it. I always imagined her books to be romance orientated, but this book was definitely not that way. This is the story of Lou, who is always battling with time. He is always in two different places at the same time. His mind will be thinking about the next thing, whilst he is working or spending time with his family. He hasn't really been the best father, husband or son in recent years, but things begin to change when he meets a homeless man, Gabe, who Lou gives a job too. With the help of Gabe, Lou begins to realise what the value of time really is. He learns what things are important in life, but he learns it too late. I was nearly in tears by the end of this book, but it is definitely one that makes you appreciate what you have and you begin to look at how you prioritise your time. It was a beautiful heartfelt story and one that makes you think. This book was made into a film a few years ago, which is called 'Christmas With The Kranks', starring Jamie Lee Curtis and Tim Allen. I have always been a huge fan of the film, it is one I can watch over and over again, so I was dubious as to whether the film and book would match up. I was wrong to worry, the book is just as good as the film and I kept laughing whilst reading it. It is definitely not a book you would imagine John Grisham writing, as it is comical right through to the end. I think he may have missed a vocation as a comedy writer. The book tells the story of Luther and Nora Krank who are feeling low, after their daughter Blair leaves home to travel for the first time. Neither of them are looking forward to Christmas without her, so Luther comes up with a plan to skip Christmas completely and go on a cruise instead. The book follows their antics as they try to defy neighbours and friends by not entering into the spirit of Christmas; no cards, no calenders, no Christmas tree and definitely no Frosty on the roof. They do really well, until Blair phones to say she is on her way home for Christmas with the family, bringing her new fiance, Enrique. All hell breaks loose, as they try to create Christmas in 12 hours. Luckily for them, their neighbours come to the rescue. This is just a brilliant book and definitely worth a read in the run up to Christmas. It is a quick read, so could easily be fit in, in between, making mince pies and wrapping presents. 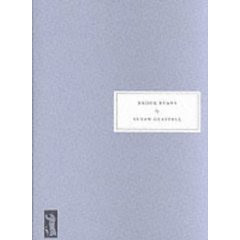 3) Brooke Evans by Susan Glaspell - pages 312. My first Persephone book! My, how I loved it. I have been watching other bloggers such as Nymeth and Paperback Reader, talk about their love of Persephone books and I was not one to sit on the sidelines. I trust these bloggers with my choice of reading, so I knew I waas missing out on some good. My curiosity got the better of me and I searched through the library to find some to read. Brooke Evan was my first and will definitely not be my last. The book follows the life of Naomi Kellog, who becomes pregnant by her boyfriend. Her boyfriend gets killed during an accident and Naomi's parents take up Caleb Evan's offer to marry their pregnant daughter to stop any embarrassment outside of the family. Poor Naomi, is forced to marry a man she does not love and endures years of unhappiness. As her daughter grows up, Naomi tries to make sure her daughter, Brooke, does not make the same mistakes she did and follows her heart to find her true love. However, Brooke has her own mind and her true love isn't the same one her mother thinks it is. It was a beautiful story set during a time where pregnancy outside the marriage was frowned upon. You could really feel Naomi's pain and anguish, she suffered her whole life so that her daughter wouldn't. Yet it wasn't until her daughter had a child of her own, that she realised what her mother had tried to do. This is a book about straightening the past and putting old wrongs right. I think I shall have to venture to order the Persephone catalogue now, to see what else is on offer. All reviews for 2009 are now up to date. I don't have any statistics at all, but I plan to keep more information this year, so I can look at my stats at the end of the year. I am still a Persephone newbie myself, but this is definitely a love affair in the making. Brooke Evans sounds like another wonderful book. Skipping Christmas is one of N's favourite books. I've never read it myself, but every year in December he tries to get me to read it :) Maybe next year..
Nymeth - it was fabulous. Would definitely recommend it. Blodeuedd - I know it is hard to believe, but this book is actually funny. I would never have guessed it myself. Clover - you need to read it next year. It is a really quick book, so it won't take you long. I would never have picked that book up BECAUSE it's John Grisham. Naughty preconceptions. It does sound funny so I will look out for it... I've never seen the film either which is surprising as I'm a sucker for Christmas films. Not only have I not read the book but the film also seems to have passed me by. I'll be certain to make a note of Christmas With the Kranks and hopefully this year my Christmas Book Challenge reads may be a little more to my taste. Well done on these reviews, always better late than never. I like your short reviews post! I may try it myself at some point. I read Skipping Christmas a few years ago. I liked it more than the film version. I really enjoyed these mini reviews a lot. I thought Skipping Christmas was fun. I have not read the other 2 though. I'm so glad that you enjoyed your first Persephone! Brooke Evans is one that I haven't read yet but recently really wanted to buy it but it was at that time reprinting; I'm visiting the shop on Thursday and I think you have convinced me to purchase a copy along with the 1 or 2 that I was already planning to! I haven't read any Persephone books but that certainly sounds enticing! 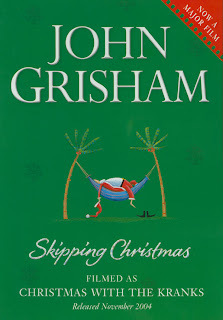 I read Skipping Christmas the year it came out and positively loved it...so funny. And while I don't dislike the film, I don't love it either. I think it's just that whole having read the book first thing. Way to go! I still have 2009 reviews to write. I must be a total dunderhead ~ I didn't realize Christmas with the Kranks was based on a Grisham book. It was a hilarious movie! Thanks for the reivew, I may have to check this one out. Carmen - I know, it is hard to believe he is capable of writing comedy, but he does. Petty Witter - it is ideal for the Christmas challenge. Very quick and easy. Mary - sometimes I get bogged down with so many reviews outstanding. This way I clear the back log and feel like I can breathe again. Diane - glad you liked it too. Paperbackreader - Thanks to you and Nymeth, you have opened a whole new world of reading to me. Nicole- you must read them. They are so good. Debi - I just love the film, but I am a big sucker for Tim Allen. I will watch him in anything, as I find him so entertaining. I love all the Santa Clause movies too. J.Kaye - but you are so organised. I can't believe you are not up to date. I am loving your writing blog at the moment. Kaye - I didn't realise until someone told me. You wouldn't put the two together at all. The Grisham book sounded like a good holiday novel. I enjoyed reading your mini reviews! I didn't realize Grisham's book was the basis for the movie, and it sounds very funny. I'd never heard of Persephone books before, but now I'm intrigued. It looks like you've been doing some good reading lately. I read Skipping Christmas years ago and really enjoyed it. Skipping Christmas is one of my all time favorites-as well as the movie. They both make me laugh and laugh. I also just finished The Gift before Christmas but have not written up a review. You did a superb job and like you, I was nearly in tears. Ahern is a favorite author of mine, and while her first two hits tended to be on the romance side, all her subsequent books have had that element of modern day fantasy/supernatural. Some of her earlier fans have not followed her to her new niche, but I have and am never disappointed in her. Great reviews and great way to get them done! I tried to read Skipping Christmas once (a long time ago) and didn't make it very far into the book. I just wasn't in the mood to read it at the time, and like you said, it's not a normal Grisham read and that's what I wanted at the time. I'll have to keep this in mind though for when I want a good funny Christmas read. I've been a fan of Cecelia Ahern for a while. I haven't had a chance to read this one yet. Skipping Christmas is a favorite of mine too. I must have watched the movie 3 or more times this Christmas alone. I enjoyed the book as well.